Every summer, scores of visitors and locals flock to the shoreline of Lake Tahoe, beckoned by wide sandy beaches, abundantly clear skies, and 39 trillion gallons of crystal alpine lake water to beat the summer heat. No one can blame these beachgoers for taking in the ground level view of one of the largest alpine lakes in the world. But for other adventurous types in the Tahoe basin, the ground level view is just the beginning. Indeed, those who make the trek to the top of the granite peaks looming over Tahoe’s waters are rewarded with the experience of a lifetime. The Sierra Nevada and Carson range rise thousands of feet above the shores, framing the opal lake with a chain of deep green forest and jagged granite peaks. Climbing any of these peaks is certainly a challenge, but with the right preparation, the reward at the summit is well worth the effort. Here, a list of the four must-climb summits to add to any Lake Tahoe peak bagging list. Perhaps the most iconic peak in the Lake Tahoe basin, Mt. Tallac (pronounced TUH-lack) can be seen from almost any point in Tahoe, as the 9,735-foot summit seems to erupt out of the lake’s southwest shoreline. Its jagged ridgeline and glacially carved face give Tallac the look of a truly formidable mountain. Incredible panoramic views of the near entirety of Tahoe’s shoreline, stunning views of Desolation Wilderness, and far-reaching mountain ranges stretch out in all directions from the summit. But it will take some effort to get there. The strenuous nine-mile roundtrip hike gains over 3,000 feet of elevation and should be tackled with a healthy dose of respect and humility. 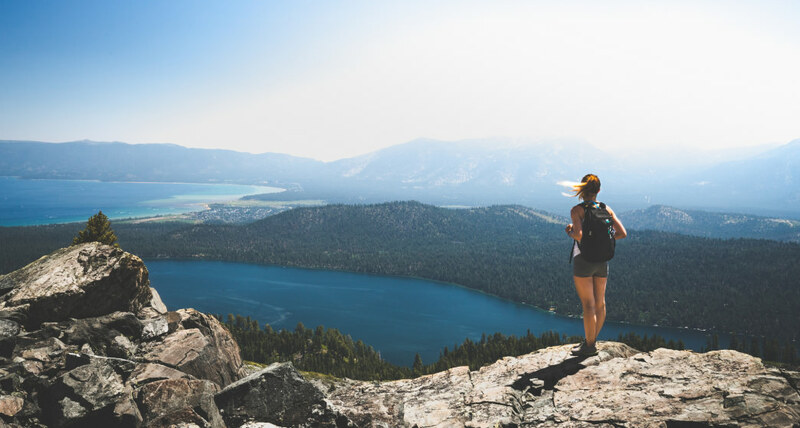 Be sure to bring plenty of water (at least three liters per person) and a water filter, as most of the Tallac hike is done with extreme sun exposure. Holding the honor of Lake Tahoe’s highest peak, the 10,886-foot summit of Freel Peak demands a full day effort from most hikers in exchange for its top of the basin view. An incredible highlight on this trek for any budding naturalist is the incredibly diverse array of microclimates and ecosystems one must traverse to reach the summit. 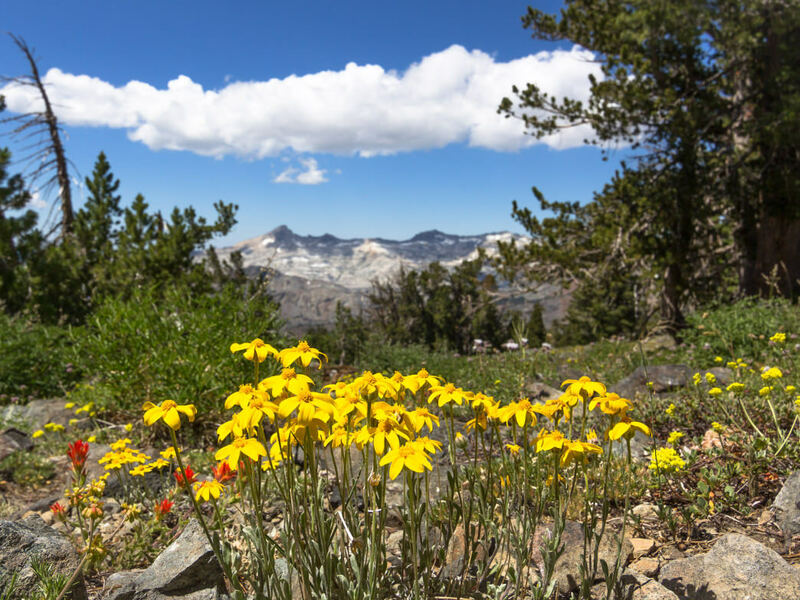 This hike starts from the lush forests of jeffrey pine and verdant meadows at the base, through the stunted western white pine and whitebark pine forests of Freel’s northern slope, to the windswept barren summit ridge, where only the most hardy of plant life survives. 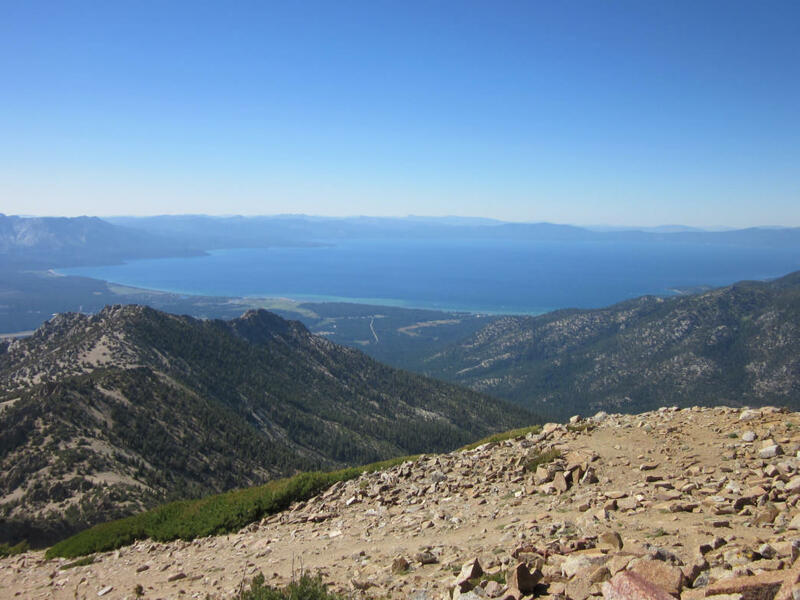 An important disclaimer: The views of Lake Tahoe aren’t actually phenomenal from Freel’s summit, as the ridgeline of nearby Monument Peak obscures most of the view. However, from the summit of Freel the view stretches for seemingly endless miles east across the great basin of Nevada, south through the rugged Sierra, and west across the Pacific Crest. Stacking up as the tallest peak on the Nevada side of the Lake Tahoe basin, Mt. Rose offers hikers a unique contrast between the vast blue waters of the alpine lake and the desolate and parched reaches of Nevada’s Great Basin. Peak baggers with their sights set on Mt. Rose have the distinct advantage of beginning their hike from one of the highest trailheads in the region. Starting at 8,911 feet, this 10.4-mile roundtrip adventure climbs through pine forest, traverses through verdant meadows filled with wildflowers, and climbs past gushing Galena Falls en route to the 10,776-foot summit. To get there from Incline Village, take the Mountain Rose Highway 431 toward Reno, parking at the obvious summit trailhead before the road winds down to Reno. Be sure to bring plenty of food and water on this long, hot hike. 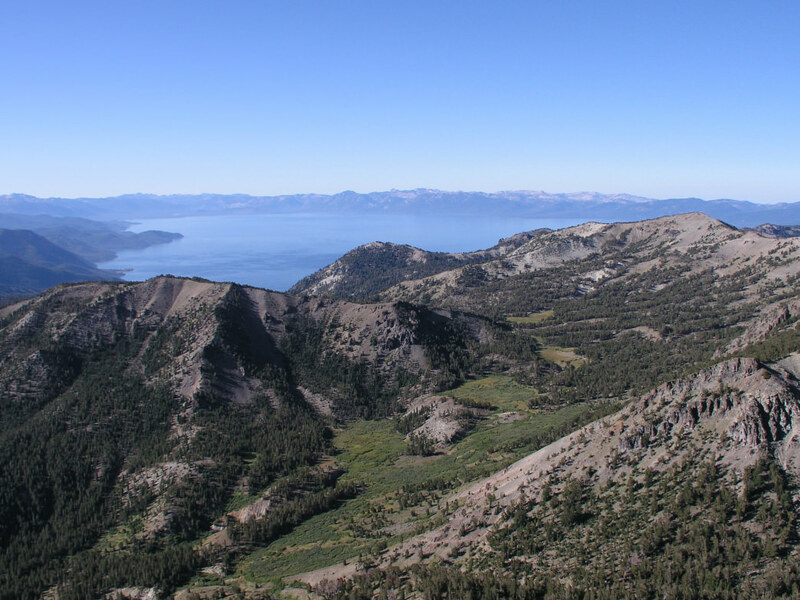 An often overlooked peak in the Carson Range on Lake Tahoe’s eastern ridgeline, Snow Valley Peak offers stunning bird’s-eye views of Lake Tahoe and the Carson Valley. Covered in rolling slopes of mule’s ear, sage, and wildflowers, the hike to the 9,214-foot Snow Valley Peak feels like part desert trek, part alpine oasis. 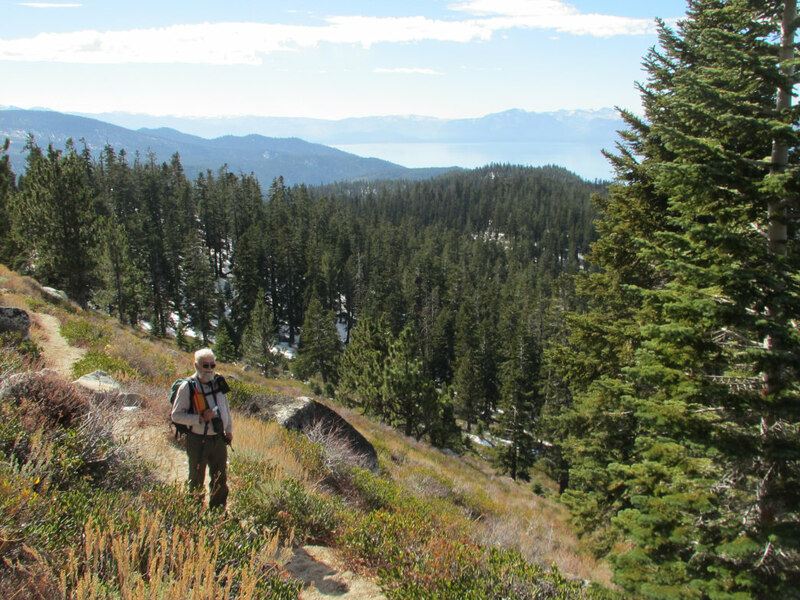 This approximately 12-mile round trip hike gains just over 2,000 feet of elevation from the Spooner Summit trailhead of the Tahoe Rim Trail. 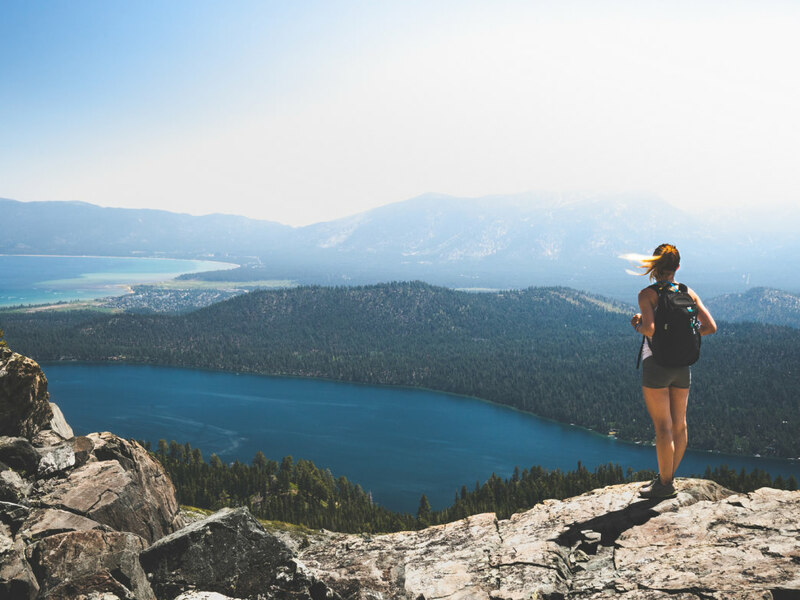 To get there from South Lake Tahoe, take Highway 50 toward Carson City for approximately 15 miles before parking at the Spooner Summit Tahoe Rim Trail trailhead on the left side of the highway.